One hundred and fifty years ago, on April 6, 1860, Henry Wadsworth Longfellow stood at his writing desk, in the front parlor of his house on Brattle Street in Cambridge; he picked up a pencil and wrote those lines on a folded sheet of paper. Little did the poet realize that he was crafting what would become the most enduring of all his poetical works. Nor did he realize that he was creating a national legend, a mythic hero whose story still would be told and retold a century and a half later. Longfellow’s thoughts that morning were undoubtedly on the tensions in his own nation, tensions which would erupt in a great Civil War almost one year to the day after he penciled those lines on a sheet of foolscap. He was thinking too about his visit to Boston’s North End on the previous day, when he had climbed the steeple of the Old North Church, just as Paul Revere’s friends had done. And yes, he was thinking of Paul Revere himself, the silversmith and midnight equestrian who had heralded another upcoming war, some eighty-five years before. Longfellow had long known the story of Paul Revere’s ride “through every Middlesex village and farm” in 1775. Twenty-two years after that fateful ride, Revere himself had been asked to detail the events of that April night. His recollections were published in the Massachusetts Historical Society’s Collections in 1798, then reprinted in October 1832 in J. T. Buckingham’s New England Magazine. By coincidence, that same October 1832 issue of New England Magazine also contained one of the first published works of a 25-year-old Henry Wadsworth Longfellow: Part V of “The Schoolmaster,” a prose piece describing his travels to Europe. Almost certainly the young college professor read every word of that magazine issue, including Revere’s narrative. 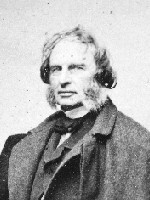 And in 1877, when Longfellow was asked about his sources, he was able to cite that magazine story by volume and page number, four and a half decades after he had first read it. The more immediate inspiration for Longfellow’s poem was the fight over slavery. Longfellow rarely got involved in politics, but he was passionate in his opposition to that peculiar institution. His Poems on Slavery were published in 1842, when some newspapers would not print reviews or even advertisements for the book, since they refused to put the word “slavery” on their pages. One of his dearest friends was the great abolitionist, Senator Charles Sumner. And while it seems unlikely that Longfellow himself harbored fugitive slaves at his mansion in Cambridge, there is increasing documentation of his concern for, and his financial donations to, former slaves on their route to freedom. Thursday. 5. Go with Sumner to Mr. Harris of North End, who acts as our guide through the “Little Britain” of Boston. Go to Copp’s Hill Burial ground—see the tombs of Cotton Mather, his father and his son,—then to the Old North Church, looking like a Parish Church in London. Climb the tower to the chime of Bells;—now the home of innumerable pigeons. From this tower was hung two lanterns, as a signal that the British troops had left Boston for Concord. The following morning, Friday, April 6, Longfellow began his poem, noting the date at the top of the sheet of paper before he wrote anything else. For some reason, Longfellow took an abnormally long time to complete his poem about Revere. Following the last line of the manuscript is a notation, “Finished October 13, 1860,” showing that it took the poet more than six months to write those 135 lines. Many of his much longer works were drafted in far less time. The lengthy period it took to pencil those lines helps dispel a myth. Legend had it that Longfellow read the poem at a dinner with friends, a meeting of the Saturday Club in the Parker House on June 30, 1860. That dinner was well documented by other guests, yet none ever mentioned such a reading. And the manuscript notation proves that the poem wasn’t finished until more than three months later. This article was composed by Charles Bahne, author of The Complete Guide to Boston’s Freedom Trail, for the bulletin of the Paul Revere House. Copyright © 2010 by Charles Bahne. Click here for Part 2. Extracts from the Henry Wadsworth Longfellow papers are printed courtesy of Houghton Library, Harvard University. Call numbers: Journal, MS Am 1340 (209); poem manuscript, MS Am 1340 (105); G. W. Greene letter, bMS Am 1340.2 (2379), no. 494.